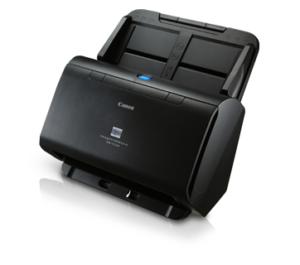 Canon’s document scanners are capable of handling a wide variety of document types, including thick documents, multi-sheet forms, and cards. Additional features like Double Feed Detection and Skew Detection correct common document feeding errors to ensure your scanning tasks run without a hitch. Touch and go with one-touch access buttons to frequent scan functions such as scan to file, scan to print, scan to email or scan to presentation. Select from a range of high performance document scanners that produce impeccable high resolution results with just a touch of the button – it’s document scanning at new heights. Embrace one sleek and incredibly compact standalone unit for all your document scanning needs: in colour, black & white or greyscale at swift speeds and faultless quality.A range of included software applications help your scans go further with advanced features such as electronic form creation, document sharing, electronic signature and database software connections. Bring out the best in your image and text documents with added features in some of Canon document scanners, such as 3-D colour correction, black & white contrast, punch hole removal and text enhancement. Adjusting text and colour for legibility and clarity, they help create documents that truly stand out.